“Pepper’s ghost” isn’t the sort of phrase you hear very often at a show like SXSW. In amongst all the latest generation technology, there aren’t too many folks discussing hundreds years old optical concepts. 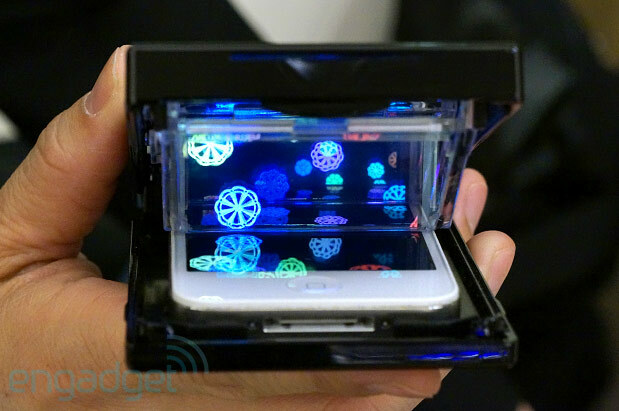 But the the idea’s a driving force in the Palm Top Theater, an iPhone case that turns smartphone videos into a miniature 3D viewing experience. The peripheral utilizes three small drop down displays — the rear is a full mirror with two half mirrors in front it, reflecting images from the phone display into what appears to be a three-dimension object — and really, it a stunning little effect. The Palm Top requires the use of a proprietary file format that essentially splits the displayed image or video into three parts. The company’s providing some video for users, as well as a converter app to make custom footage. The device is available now for around $36 — not super expensive, though it’s hard to see such a device as anything but a niche product, especially since the opening makes for a fairly limited viewing space. It would be extremely cool to see this on a larger space, but in the meantime, you’re stuck with a little window into the technology.